There are a number of Carta Guides that I wish I owned (Masada, En Gedi, Qumran, all by Hanan Eshel), but the handiest for my tours has been the Carta Guide to National Parks and Nature Reserves. This is a handy sized 447 page text with slick pages and plenty of color illustrations. Each site listed has a road map and directions, a summary of services (WC, snack bar, picnic area, hiking trails, etc.) A set of icons on the title page for each site indicates whether the location is a Jewish, Christian or Muslim site, a recreational site or an antiquities. The title section includes a phone number and best times to visit, along with a notice of fee (if any). Each heading includes a brief line drawn from the Hebrew Bible associated with the site. The Guide is divided into regions which are color-coded in the outside margins. Beginning in the north with Mount Hermon the Guide works its way south to the final entry, Eliat. Several regional maps appear at the beginning of the Guide and are marked with page numbers in the guide. Each sub-region is arranged geographically so that it is sometimes difficult to find a location within a region. The sub-sections do not strike me as logically arranged. Hermon and Gamla are in the first (northernmost) section, but Tel Dan is in the second, despite the fact that Dan is well north of Gamla. Fortunately there is a detailed table of contents, but no alphabetical index. Each location is illustrated with a few photographs (250 in all), although these seem dated to me. The Roman Theater at Beit She’an certainly is more than ten years old (p. 211) and the Masada photographs do not reflect reconstructions from the last ten years. A few photographs were taken on hazy days (Nahal Gamla, p. 53 and Arbel Cliff, p. 167), but for the most part these are helpful illustrations. The Guide includes a site plan where applicable with points of interest clearly marked (50 total in the Guide). 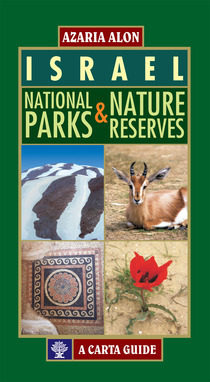 Since the Guide has entries for 60 national parks, it includes information on the flora and fauna of Israel. While this is not “biblical,” it is often necessary information when visiting a site to point out items of interest. (For some reason people always ask me what is planted in some farmer’s field or what the name of some shrubbery is.) Nature reserves are accompanied by hiking maps, although it is always best to obtain a more recent map when arriving at the park. Several Nature Reserves conclude with a short “Outside the Park” pointing out local places to eat or other memorials or parks. For example, For Ein Feshkha, the Guide points out the trail to Rosh Tzukim as well as five nearby monasteries. Because the Guide is for National Parks and Nature Reserves, there are quite a few interesting locations that are not in the Guide. For example, The road down Ma’ale ‘Akrabim (Scorpion’s Pass) has several sites of interest (Roman toll buildings, Ein Hazvot / Tamar) as well as several hiking trails. Mount Hor is in the area as well. Since none of these are on the official list of national parks, they are omitted from this guide. For my Israel tours I purchase an Israel National Parks pass which allows unlimited entry to national parks listed on the card for two weeks. This allows us to visit some sites that are not usually included in tours, such as Korazin and Kursi in Galilee; Bet Guverin and Tel Arad in the south. With the Carta Guide, I can check on a location to see if there is any interest for a biblical tour and get a quick summary of what I ought to be looking for when we explore the site. This Guide could be used along with the National Parks pass for a self-guided trip around Israel. I have been blessed to travel to Israel three times leading student groups, with a new trip planned for May of 2010. Each trip I took several books to help me as the group leader, but these books can be used by anyone traveling in Israel. There are many of these on the market, but these are the books that I will carry with me to Israel. Today I will review the most valuable of these guides, with a shorter “round up” of other books I have found helpful for guide trips to Israel. 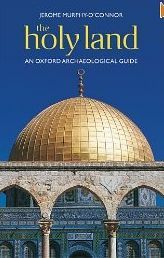 The best guide to Israel for a Christian tour is The Holy Land: An Oxford Archaeological Guide by Jerome Murphy-O’Connor (Fifth Edition; Oxford, 2008, 544 pages, $37.95, Kindle Version $13.50). I cannot imagine visiting Israel on a tour without this book in my travel bag. The book is divided into two parts. The first 173 pages covers Jerusalem, rest of the book covers archaeological sites in the rest of the Land. As should be obvious from the title of the book, this is a guide to archaeological sites, not a guide for pilgrims. While most of the Holy Sites are included, they are described in terms of their history and archaeology rather than their religious significance. The section on Jerusalem is divided by area of the Old City, beginning with the walls and gates and progressing through the quarters of the Old City to Haram esh-Sarif (Temple Mount), excavations at the Western Wall plaza, Mount Sion, The City of David, the Kidron, the Tombs in the Valley, and the Mount of Olives. Murphy-O’Connor covers a few locations outside the Old City as well. There are dozens of line-drawn maps and charts of archaeological sites along with black and white photographs and other illustrations. These small maps can be used to orient oneself when visiting a location. For example, the map of the Western and Southern wall excavations has 23 points of interest marked on the map, all of which receive a brief description ion the text. Virtually everything of interest is marked on these small yet clear maps. An extra value of the guide is the inclusion of hours of operation for locations as well as telephone numbers. Murphy-O’Connor provides advice on whether arrangements need to be made for a group or if there is I am amazed at the minor locations which are briefly included in the Guide, including places like the Convent of the Olive Tree and the Monastery of the Flagellation. The second section is a “Guide to the Land” and is arranged alphabetically. Like the section on the Old City, this section combines useful information on make the most of one’s visit to Israel with excellent illustrations and maps. The map of Masada is particularly good considering it is on a single page. Most archaeology sites describe has a site map indicating points of interest. This section also has entries for regions (Golan, Negev), Peoples (Druze, Samaritans, Nabateans) and historical events (Crusades). If there is any criticism to be of this book is that it is out of date already. Work in the City of David has been constant for the last few years, rendering this handbook a bit out of date. The material on the Southern Wall excavations is still good since that area has not has any recent excavations. My copy of the Oxford Archaeological Guide is well worn and marked with notes made on my tours. I have photocopied maps from the Guide and taped them into my Moleskin journal for note-taking from other sources. I eagerly await the Sixth Edition of this essential Guide to the archaeology of Israel! His commentary on Romans was profoundly influential, and a friend of mine once told me it would take ten years of study of existential philosophy and then ten years of study of Lutheran theology and then ten more years of studying Bultmannian theology to grasp Käsemann’s commentary on Romans. Bill Heroman kindly included a link to the recent atlas reviews in his June Semi-Carnival. In my review conclusion, I complained (gently) that the New Testament gets the short end of things in these atlases, with the Pauline sites dismissed in a few pages. Bill pointed me to the Barrington Atlas of the Greek and Roman World, edited by Richard J. A. Talbert. This is obviously an excellent resource for maps of interest to students of the book of Acts and the classical world in general. I did not include it for several reasons, but primarily because the four review atlases were recent releases (three from 2010) and these four are most likely to used by pastors and laymen. At $248 ($375 with CD-ROM), the Barrington is a serious tool to be found in serious libraries. This points out the problem for a New Testament atlas: how would it differ from a classical world atlas? Presumably an emphasis on Palestine and Jerusalem, but for Acts the major cities are well documented by standard historical atlases. I have owned the microscopic Atlas of Ancient and Classical Geography (originally printed in 1907) for years but still find some of these maps to be useful. I also appreciate Bill’s comment that this recent spate of Bible Atlases blur the line between an atlas and a Bible dictionary, or at the very least a Bible Handbook. Usually this falls into the category of a “Historical Atlas” which covers the history of the Old Testament and intertestamental period sequentially. I suspect this is to make the book a better choice for a Bible Survey course, which increases sales. One or two items came to mind as I thought about New Testament geographies. Since I am unlikely to find a purely NT atlas, books like these will have to fill this gap. 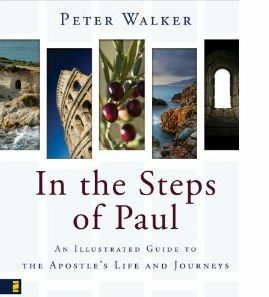 I have used Peter Walker’s In the Steps of Paul: An Illustrated Guide to the Apostle’s Life and Journeys (Grand Rapids: Zondervan, 2008, 213 pages, $19.99) for an undergrad Acts class. This book is a follow-up to his 1997 In the Steps of Jesus: An Illustrated Guide to the Places of the Holy Land and attempts to deal with locations outside Palestine and Jerusalem since they were covered in the first volume. These two books are richly illustrated with maps from Total Media Services and photography provided from the author, Todd Bolen, and a number of stock services. In the Steps of Paul focuses a chapter on the major cities visited by Paul in the order of their appearance in the book of Acts. Walker provides a sketch of the history of the city usually accompanied by a time-line and city map. It is helpful that his time-lines extend to the modern period and include the excavations of ancient cities. The bulk of the chapter is a sketch of Paul’s interaction with the particular city, using both Acts and the epistles. The chapters conclude with a section on the “city today.” This is a very handy guide of what to see if you visit the cities of Paul, including both earlier Roman and later Christian points of interest. Walker’s In the Steps of Paul in a good guide to the text of Acts and the general history of the cities Paul visited. It is neither an atlas nor a guidebook, although it has elements of both. Still, these two volumes are both refreshing to read and can be used by both pastors and laymen to orient their thinking geographically when reading Acts. 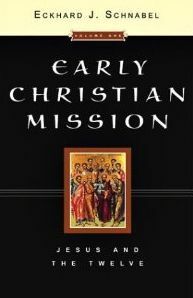 On the other end of the spectrum is the massive two-volume work by Ekhard Schnabel, Early Christian Mission (Downer’s Grove: Inter-Varsity Press, 2004, 1928 pages, 2 Volumes, $90.00). While this is not an atlas, I have made a great deal of use of the second volume which covers Paul and the Early Church. For each of the sites mentioned in Acts, Schnabel provides a historical sketch worthy of any dictionary or encyclopedia. These brief sections are fully conversant with the literature of classical historical scholarship, but they are intended to support his running commentary on the book of Acts. This volume includes 39 maps and charts illustrating the text. Some of these are the “usual suspects” (Palestine, the Roman World), but others are unique. For example, to illustrate how the ancient world understood itself, Schnabel includes the world map of Eratosthenes as well as a world map according to Jubilees. Basic city maps of many of the major cities Paul visited are also included (Antioch, Caesarea, Damascus, etc.) These are far from the quality one would expect in an atlas. The map of Rome is so small it is nearly useless. But as illustrations of the excellent text they serve well. This massive work is neither a biblical commentary nor a Bible Dictionary, although it combines elements of commentary and dictionary to describe the world the Gospels and Acts. In my view, it is indispensable for the study of Acts. It is no atlas, but the information is in the book to be discovered. Over the last two weeks I have posted reviews of four major Bible Atlases released in the last few months. All four of the atlases reviewed are excellent and each would be an important addition to any library. Each has strengths and weaknesses, but each is worth owning and using in personal Bible study. Best Maps: ESV Bible Atlas. The maps in this volume are detailed and clear, and the Regional Maps section goes well beyond the other volumes reviewed. The maps are detailed and complete, including Italy, Macedonia and Achia, Western and Southern Anatolia, Mesopotamia, Palestine, Sinai and Egypt. These maps span two large pages and are printed to the interior edge of the page so nothing is missing. Best Photography: Zondervan Atlas of the Bible. I think I was drawn to the photography in this Atlas because more than once I saw a picture which I took on one of my trips to Israel. The atlas treats us to some unusual angles of traditional sites as well as photos one does not often see in an atlas. I found myself browsing through this Atlas for the pictures more than the others. Best Illustrations: ESV Bible Atlas. The drawings of the city of Jerusalem and the Temple in various periods provide a concrete view of scholarly speculation. The IVP Atlas has excellent illustrations as well, but the ESV illustrations are more rich in details. Best Articles: ESV Bible Atlas and The New Moody Atlas of the Bible. Both of these volumes are worth considering for a college level Old Testament survey course. The Zondervan Atlas is nearly as good, but the depth of the ESV and Moody atlases is hard to beat. I might give the edge to the Moody Atlas since it includes a great deal of documentation and footnotes. Best Layman Atlas: The IVP Atlas. The maps are clear and the art well-presented. The articles are brief and contained to a pair of pages. I can imagine someone using this Atlas while reading through Joshua or Judges and tracking events on the maps. The IVP Atlas is not “dumbed-down” by any means, but will likely be a favorite for the casual reader. Best Scholarly Atlas: ESV Bible Atlas. While the New Moody Atlas is close, there is simply more details provided in the ESV Atlas. What is missing from these Atlases? As I said a few times in the reviews, I like to compare the map of David’s to Solomon’s Jerusalem, to Nehemiah’s Jerusalem, and then to the New Testament period. This is harder to do with these maps on separate pages. I would have liked two facing pages with all four periods on it. What ever happened to the plastic overlays that used to appear in Atlases and encyclopedias? I suppose they have been dropped to keep price down, but they could be useful for demonstrating the growth of the city of Jerusalem. Another general problem with Bible Atlases is that they seem to be limited in the New Testament period. A few pages for the world of Jesus and then a few more for the Pauline mission. I know that the “biblical world” tends to refer to the Canaan, but there is far more that could be done on the Roman world in which Paul ministered. Some of this is in Ephesus, Corinth and Rome could be given more details and maps. All the atlases include a section on the seven churches of Revelation, but these cities were already a part of the Pauline mission. Dismissing the geography and history of Asia Minor in two or three pages covering the seven cities seems to me too limited. I would like to see an atlas that was focuses solely on the New Testament geographically and historically. These four volumes are all excellent contributions to the study of the geography of the Bible. I think that the ESV Bible Atlas and the New Moody Bible Atlas would make excellent textbooks for an Old Testament survey course, although all four would serve well.